The Yellow-eared parrot -Ognorhynchus icterotis- is an Andean species the size of a small macaw, 42 cms. approximately, when it reaches maturity. With a strong herd instinct it moves regionally and depends on the Ceroxylon, spp. - wax Palm trees- since it needs it to eat, sleep and nest. At present it is one of the most endangered parrot species due to the destruction of its habitat and shooting of individuals. According to the IUCN, this species is classified as being in critical danger (CD) due its restricted distribution this fact makes the species even more vulnerable. In 1998 the ProAves Foundation began the Yellow-eared Parrot Project with the support of Loro Parque Fundación, the Society for the Preservation of the Species and Colonies (ZGAP) and American Bird Conservancy. The main aim of this project was the preservation and survival of the species as well as the protection of its habitat in the Colombian Andes. In 1999, after one year of research, it was found a colony of 81 individuals in the Central Andean Mountain Range, in the department of Tolima. Later, in January 2001, a colony of 63 individuals was found in the surroundings of the Western Mountain Range, in the department of Antioquia. These two colonies have been monitored since then and several studies have been carried out. This has allowed ProAves to get very relevant information regarding their diet, distribution, reproductive biology, use of their habitat and demography among others and all this data has been compiled in a database to use it a the basis for the programming phase of a future strategic action aimed at the preservation of these species. The Endangered Yellow-eared Parrot population in Tolima Department has reached historically high population levels with 727 individuals following there most successful breeding season with 291 chicks fledged from 131 nests, thanks to on-going conservation actions. In 1998, the Yellow-eared Parrot was almost extinct. After 11 years of sustained conservation efforts by ProAves, Loro Parque, CI and ABC the Yellow-eared Parrot has recovered to over 1000 individuals – a triumphant success. Now the IUCN Red List status of the Yellow-eared Parrot is being moved to a less threatened status. 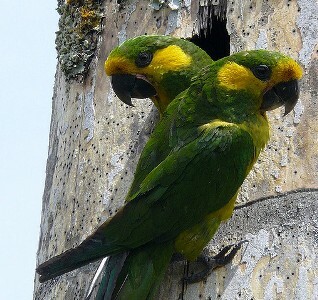 An unprecedented 203 Yellow-eared Parrot chicks successfully fledged from natural nests and artificial nest boxes between May-July 2008. This is the highest fledgling success ever recorded by the ProAves project since commencing in June 1998. Supported by Loro Parque Fundación, the best ever breeding season of the Yellow-eared Parrot was recorded in Tolima in 2007: 52 active nests produced 132 chicks! The population of the Yellow-eared Parrot has increased greatly since ProAves began to conserve this species in 1998.